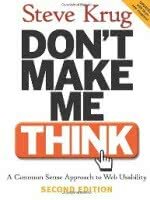 Don't make me think is about website usability, but really well written so that non-UX people like me can read it fast and easy. Go read the review first, then the full book! Everyone frustrates when faced with an unfriendly website, but how can we define unfriendly& bad or not usable? This book tries to provide an insight of web usability, of how "simple means better" in almost every case regarding to web design. We can learn to see through the eyes of a common web user, instead of our biased "expert" point of view. Web development problems, web design problems, even web content problems are explained and given some directions on how to correct and avoid them. Designing the layout, the colors, the navigation and the home page (critical point, as it will be the first sight of many visits) elements have almost their own chapters because of their importance. Basics of usability, focus groups, testing and accesibility are other related topics mentioned in the book. We even have examples and workarounds for arguments regarding web site usability, not only the designer's point of view, but the ones of the developers, marketing staff and stakeholders. The book is only around 200 pages so doesn't takes too much time and is also quite easy to read, because of its simple language, abundant examples and explanations when needed. If you do develop or design websites, you should grab this book and read it. It really opens your eyes and makes you think more about how to do things easy for the real end users.